"Did all our excursions by rail and bus: Loch Lomond, Mallaig, Oban & Tobermory." Peter and Diana Halesworth. The railway carriage is well placed for public transport connections to numerous places of interest. Even without a car you'll be able to have a great day out every day! Bus, train & ferry timetables are in the information rack in the carriage. Further copies can be obtained from the village shop and Tourist Information in Oban. Oban - use Train or Bus from stops outside the village shop. - See our 'Links' page for details of places of interest. Ferries from Oban to Mull and other islands - travel on Caledonian MacBrayne. 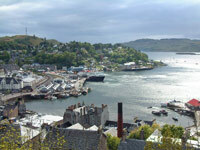 Pier offices can be found alongside the railway station in Oban. Calmac offer a range of all-inclusive day-trips. 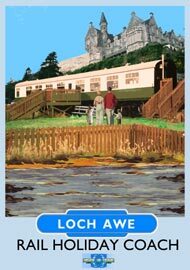 Inveraray - for castle, village, gaol and George Hotel - bus from Lochawe village. Cruachan Power Station (The Hollow Mountain) Bus from village OR 5 minute train journey from Loch Awe station. Please note- Falls of Cruachan Platform is only open from the 3rd week of May until the 3rd week of September (please check timetable for details). Admission to 'The Hollow Mountain' is FREE upon presentation of a rail ticket to Cruachan that is valid for the same day. Inverawe Smokery - at Bridge of Awe. Bus then 1 mile walk. Taynuilt - for Hotel, shops, tea room - Train then very short walk. 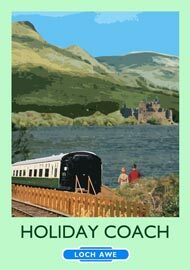 For Bonawe Iron Foundry and Loch Etive Cruises - train then a slightly longer walk!! Ardlui and Arrochar & Tarbet - Two stations on the shores of Loch Lomond - providing excellent walks (inluding 'The Cobbler'), ferry trips (please check timetable in 'info rack' for details). Also some bus routes connect at Tyndrum/Crianlarich. Hill House - Charles Rennie Mackintosh's masterpiece. Owned by the National Trust for Scotland - Train to Helensburgh Upper. The Scottish Sea Life Sanctuary - Bus or train to Connel and then change of bus required to centre. St Conan's Kirk - walk through village towards Oban. Approx half a mile. Rannoch Moor - Train to Crianlarich (cafe) and then change (good connections) to Fort William/Mallaig train. Get off at Bridge of Orchy, Rannoch or even remote Corrour. Dunstaffnage Castle - Bus then half mile walk.